Fragrant, creamy-crumbed muffins, the best of their kind, but you must grate one and a half whole little nutmegs to make these perfect creations. Although whole nutmegs feel like rocks, they are rather soft and easy to grate. The flavor of freshly grated nutmeg is incomparable. 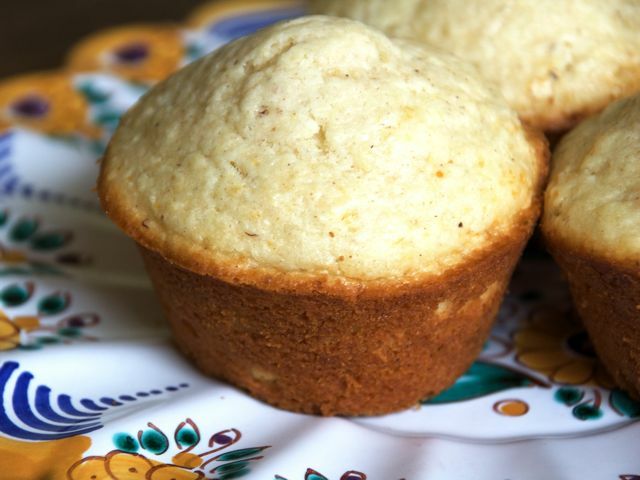 These muffins taste good with fruit, butter, or all by themselves. Stir together with a fork the flour, sugar, baking powder, grated nutmeg, and salt in a medium bowl, thoroughly combining the ingredients. Beat the egg well in a small bowl, then stir in the cream, milk, and butter and blend well. Add the cream mixture to the flour mixture and stir only until there are no streaks of flour; don't overmix. Spoon batter two-thirds full into each muffin cup. Bake for about 20 minutes or until the rounded tops are lightly golden. Remove muffins from the pan and serve warm, or cool on a rack and store or freeze for later use; warm before serving. Culinate editor's notes: This recipe actually makes 15 or 16 muffins, not 12. And 20 minutes is rather long for a batch of normal-sized muffins, so if you're using an ordinary muffin tin, check on the muffins after 15 or 16 minutes; they may be done even if not browned on top. If you don't have enough cream or milk on hand, replace the liquid dairy with buttermilk or a mixture of yogurt and milk. You can also replace the butter with vegetable oil.